Today’s unemployment figures provide a grim reckoning of the mounting human, social, and long-term economic cost of thE government’s failures on the economy. Today’s unemployment figures (pdf) provide a grim reckoning of the mounting human, social, and long-term economic cost of this government’s failure to preserve and sustain the recovery it inherited from Labour last year. In June 2010, shortly after the Tory-led coalition was formed, he confidently proclaimed that “unemployment will be falling during this parliament”. At the start of 2010, our economy began to recover from the effects of the global financial crisis. But since the Conservative-led government took over things have gone into reverse. George Osborne claimed that if he cut further and faster, the private sector would be able to fill the gap. But this hasn’t happened. His plan is not working. Today’s figures show unemployment is now worse than it was in the depths of the recession that followed the global financial crisis. Unemployment at 2.64 million is at a 17-year-high, and youth unemployment, now more than one million, is at the highest rate since records began. And the situation could get even worse over the next two years if the government refuses to change course, according to forecasts published by the independent Office of Budget Responsibility last month. The rise in long-term unemployment has been particularly alarming. Almost a third of the total unemployed – 868,000 – have now been unemployed for 12 months or more, facing their second Christmas without a job. And perhaps even more worrying is that the number of 18-24 year olds on the dole for six months or more has risen by a shocking 93 per cent since January this year. For those leaving school, college and university to find their career hopes dashed and the doors to economic independence and participation closed, the effect can be devastating. The Prince’s Trust has documented the feelings of shame, rejection, anxiety, insecurity, depression and loneliness that young people in this situation are likely to feel. But this personal tragedy is also a massive loss to the rest of society. Stubbornly high levels of unemployment lie at the root of the government’s inability to get the deficit down according to its promised timetable – and consequent need to borrow £158 billion more than originally planned. To reduce the deficit, we need to get people working – paying taxes and not reliant on benefits. Youth unemployment also has a devastating and irreversible impact on our productivity and growth potential over the longer term. Research (pdf) shows that periods of unemployment early in adult life has a permanent negative impact on people’s employability and earning potential throughout their lives – as well as their wellbeing and happiness. The price of this waste of talent and potential will be paid not just in the benefit bills of today but also in lost growth and prosperity for decades to come. 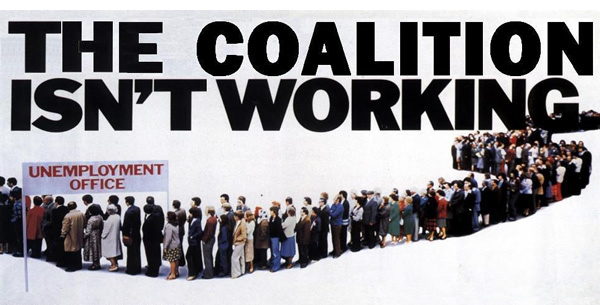 The government’s answers to this problem have amounted to half-hearted, half-baked and tragically belated reinventions of programmes Labour had up and running and working in 2010 but which the new Conservative-led government abolished as soon as it was elected last year. The Work Programme is one of them. The employment minister Chris Grayling ardently sells it as “a giant employment dating service”, as if it were a new invention. But job-matching services have been around for years. The Work Programme replaced Labour’s Flexible New Deal. Between May and August, while the new scheme was being set up, 86,000 fewer people left benefits than the year before. The new Work Programme is, according to Parliament’s expert work and pensions select committee, about a third smaller than the schemes which Labour had in place. The Social Market Foundation warns that it is under-funded, and because the government hasn’t been willing to invest enough money in it the providers they have contracted to help people could go bust. This would mean chaos for people who are struggling to find a job. The Work Programme is meant to be a boost to the ‘Big Society’, using specialist charity providers to get support to the hardest to help. But 85 of the 508 charities signed up originally have left the scheme, and others report they simply aren’t seeing any customers. And we won’t know until October 2012 – more than 17 months since it began – how well the scheme is performing. Apprenticeships are the government’s second answer to high unemployment. For the economy to grow we need a skilled workforce – and apprenticeships can really help young people to get a foot in the door of a fulfilling career. But, worryingly, the growth in apprenticeships for young people has actually slowed: from a 25% increase under Labour in 2009/10 to a 15% increase in 2010/11. In terms of raw numbers that’s 10,100 fewer additional places. And the danger is that much of the increase in apprenticeships is simply on-the-job training for people aged 25 and over, after the government cancelled schemes that offered that help. The increase in apprenticeships is not doing enough to help young people into careers – the coalition runs the risk of contaminating the brand. It has taken youth unemployment crossing over the one million threshold for this out-of-touch government to take any action. They are finally introducing, next April, a ‘Youth Contract’ – a scaled down and less ambitious version of the ‘Future Jobs Fund’ established by Labour, which offered 100,000 jobs to young people who were long-term unemployed. Cameron called the Future Jobs Fund a “good scheme”, and Theresa May, then shadow work and pensions spokeswoman, promised she wouldn’t cancel it before an evaluation had taken place. But it was cancelled a few weeks after the election – the promised evaluation was due next month. It’s a scandal young people have had to wait a year and half for the government to restore a cut-price, half-hearted version of a scheme they peremptorily abolished as soon as they were elected. The ‘Youth Contract’ will not be up and running until next April, and hopes for its impact on the current situation are not high. We argue much more is needed. That is why Labour has set out its five point plan for jobs, which includes a bankers’ bonus tax to fund 100,000 jobs for young people, and a temporary VAT cut to put money back into people’s pockets, giving confidence to businesses to lift recruitment freezes and take more people on. Leaving increasing numbers of young people on benefits, missing their chances and giving up on their dreams, isn’t just a cruel fate to inflict on them and their families – it’s also a massive drag on any effort to reduce the deficit and a permanent loss to our long term well-being and prosperity. This country has immense potential – what Ed Miliband has called ‘the promise of Britain’ – but a Tory-led government with the wrong vision and the wrong values is letting the next generation down. We cannot let them get away with it. Lumbering the next generation with massive debts isn’t going to help them either. Value of everything, price to pay of nothing. So far I’ve attended 3 appointments and have had 1 appointment cancelled and one appointment carried out over the telephone because my advisor had to go on a training course, therefore could not keep my appointment. So far, not a single mention has been made to me of any employer. So far, I have had to find my own vacacies through the traditional channels and ensure that my advisor sees copies of all the emails back and forth. Then she fills out a computer form to book my next appointment… to check the same things. In three months they have not forwarded to me information of any job or details of any employers. I continue among other things, to look for employers via the YouGov website via JobcentrePlus. My feeling is that in the new year I shall be stacking shelves in the supermarket as a mandatorily volunteered third-class worker that is a JSA claimant, working for the £53.70 JSA that I receive (plus council tax, I am also paying a mortgage from the income that I receive from JSA). If they were to scrap all these intermediaries, and concentrate on a genuine and honest job matching, face-to-face service, like the kind of face-to-face job-matching services that job agencies used provide to job seekers 20 yrs ago, that would improve greatly my chances of finding sustainable work. These intermediaries are expensive and so far, do not seem able offer any sustainable jobs with any credible employment prospects for anybody. What happened to Reeves’s bonus at HBOS? Labour created a so many state Jobsworths, & more than a few Bankers. It’s a painful road to correcting the imbalance, but it must be done.